As a Curator at a Sporting Museum you may be wondering how my blog relates to Natural Science Collections… I am lucky enough to work at the National Horseracing Museum; part of the National Heritage Centre for Horseracing and Sporting Art, recently shortlisted for Museum of the Year 2017! A major redevelopment and move to a 5 acre site has allowed the Museum a huge expansion. 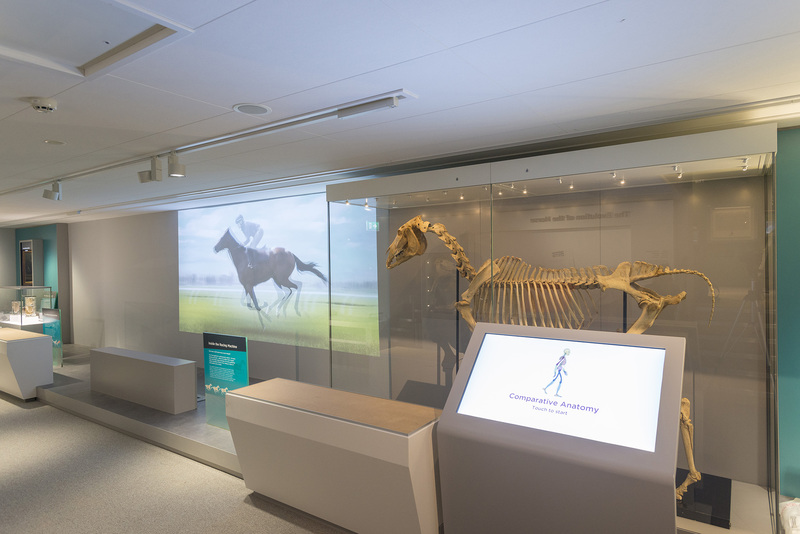 Our new galleries include exhibitions dedicated to the science of the sport and the racehorse. Within these we are fortunate to possess some specimens on long term loan as well as some wonderful new loans from our fellow, and more obviously natural science, museums. The redevelopment has been a great way to (rapidly) develop collection handling, packing and moving skills! (© National Heritage Centre for Horseracing and Sporting Art and Animal Health Trust). 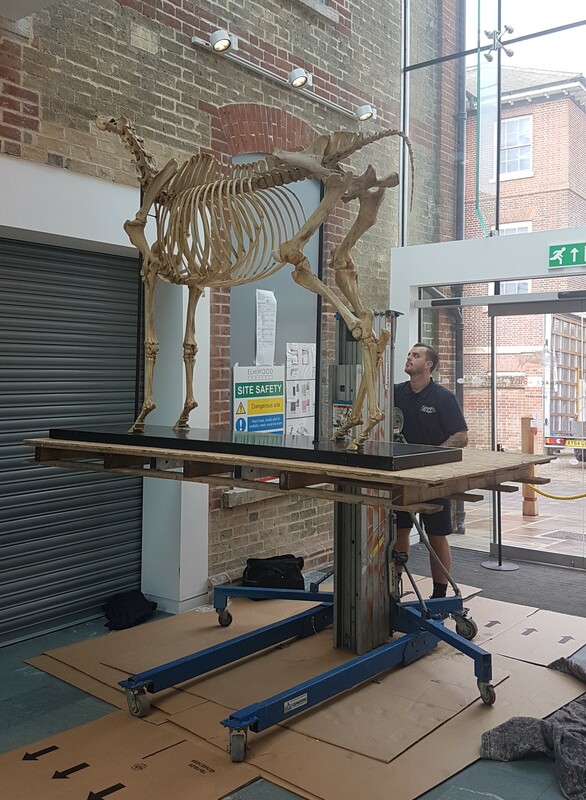 The skeleton of racehorse Hyperion was on display in our old Museum and formed the main focus of the previous scientific displays along with a small veterinary collection. We have a few other equine specimens in the permanent and loan collection; two taxidermied horse heads, a tail and, my particular favourite, our mini spirit collection of 3 horse forelimbs and an aneurysm. We also have some specimens spanning the classification of art and natural science. A veritable stampede of horse hoofs that were kept as mementos of favourite and successful racehorses and turned onto decorative and practical objects such as ink wells and snuff boxes. 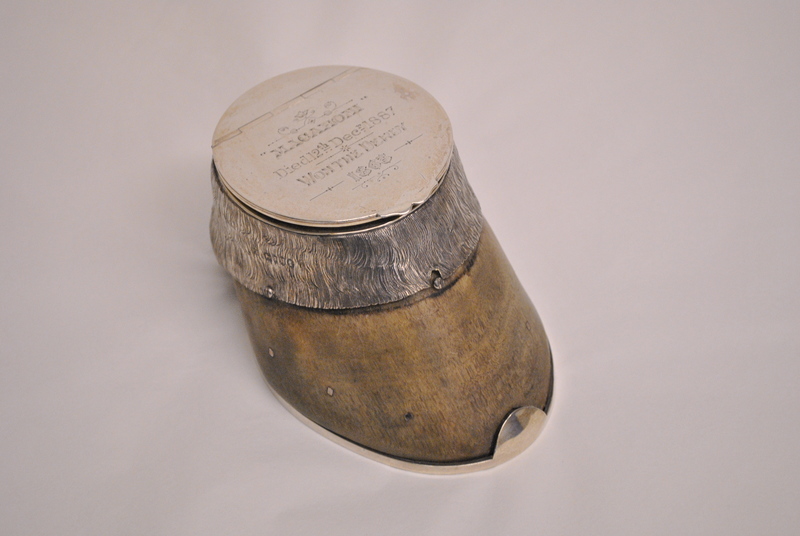 This hoof belonged to racehorse Macaroni, who won the Derby in 1865. It died 12th December 1887. (© National Heritage Centre for Horseracing and Sporting Art). The redevelopment has allowed us to revisit our natural sciences collection. Hyperion transitioned into the new displays and is a main part of our comparative anatomy display in the Inside the Racing Machine exhibition. A well-known racehorse; he’s a specimen of interest to racing and science geeks alike. He supports engagement with skeletal anatomy and comparative human-equine anatomy. 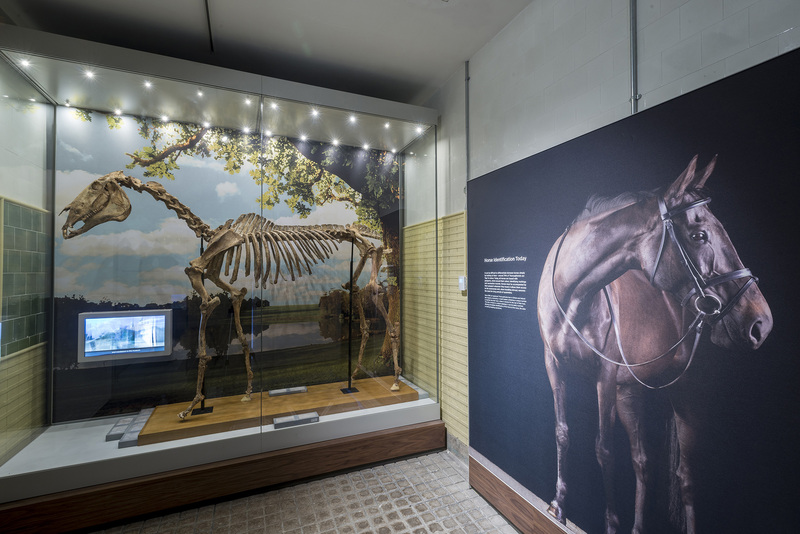 Hyperion in The Maktoum Gallery of the Thoroughbred- visitors can explore anatomy through a digital interactive and low-tech tactile interactive using the skeleton specimen as a real life reference. (© National Heritage Centre for Horseracing and Sporting Art and Animal Health Trust). This gallery also includes some fascinating loans from other museums. Fossil casts and specimens from Sedgwick Museum of Earth Sciences and Museum of Zoology, both in neighbouring Cambridge, and a jaw bone of Equus from National Museums Liverpool support our display on The Evolution of the Horse. From the Hunterian Museum we have borrowed specimens of equine and human organs which accompany our comparative anatomy display. As all Natural History curators know the only thing better than one specimen skeleton is two specimen skeletons! This skeleton is thought to be that of Pot8os, the famous son of Eclipse. It supports a display about the use of historic mtDNA in the identification of skeletal finds. (© National Heritage Centre for Horseracing and Sporting Art). With the support of SHARE Natural History Network I’ve enjoyed taking responsibility for these science collections and as a relatively new member of NatSCA I have been inspired to grow our modest collection. In the future I’d like to expand our spirit collection to include equine organs and perhaps develop a herbaria collection to record the unique habitat of Newmarket Heath. Perhaps some strength exists in having an unexpected Natural Science collection. We can capture and interest a different audience; visitors that have come to us for the art galleries or the racing history and never knew they would find bones, fossils and a preserved equine brain just as interesting! Written by Briony Jackson, Science Learning and Participation Curator, at the National Heritage Centre for Horseracing and Sporting Art.